In a Nutshell: Not only can starting your own business be a great way to improve your income and pay off debt, but can also be a way to find a more fulfilling work life. An important part of establishing your new business is building a strong online presence. However, looking at the pages of code that go into a good website can be enough to intimidate even the stoutest entrepreneur — unless they use Jimdo. 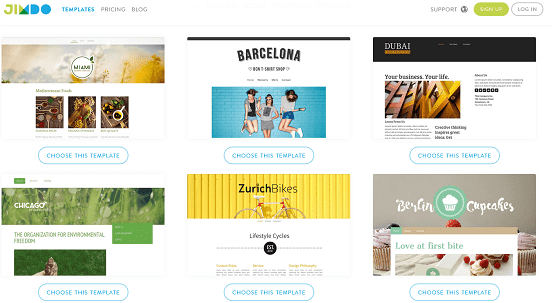 A streamlined, feature-packed website-builder, Jimdo empowers users to drag and drop their way to a professional, adaptive web page, blog, or online store in just minutes. In addition, Jimdo offers a range of features designed to make managing your growing site a breeze, including automatic updates, multiple SEO options, and easy-to-use analytics that can turn anyone into their own webmaster. While few can deny the importance of a proper budget, there may be times when the numbers simply don’t add up, no matter how meticulous the math. This can be especially true when one side of the equation includes a pile of debt. The fact of the matter is that when your expenses have started to dwarf your income, the only real solution is to, well, get a bigger income. It can be stressful to consider taking on a side job — or even changing careers entirely — to improve your income, but it may also be an opportunity. It could be a chance to start something new or explore the profits of your passion. More than 27 million working-age Americans are starting or running their own businesses, and it’s making them more than money; studies show those entrepreneurs are also happier than everyone else. Of course, whether you want to start a side hustle or launch a brand-new career, every modern business needs an online presence. And now, with the drag-and-drop functionality of the Jimdo platform, website building is no longer the sole domain of the programming wizards and code commanders. Jimdo can empower anyone to build a complete, professional website in no time. The desire to help people begin new journeys through web building is more than just a sales pitch at Jimdo — it’s also the founding story. Jimdo’s entrepreneurial founders have made their lives about helping others go digital. Christian Spingub and Fridtjof Detzner started their first web agency at the tender age of 18, joining up with Matthias Henze as their company grew. It was during this venture that the inspiration for Jimdo struck. When the Jimdo founders set out to create the platform, they knew that, at its heart, it needed to be easy to use. That inspiration is seen in every aspect of the platform, starting with the installation — or lack thereof, to be more precise. 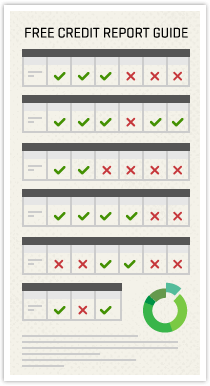 Jimdo users can choose from many professional, responsive templates with which to build their page. The key to Jimdo’s coding-free page building is the use of different pre-made page templates that users can then customize. Users can easily add photos and logos, change colors and fonts, add blog posts, and even set up an online store, all without ever typing a line of code. The streamlined interface means you have everything you need — and nothing you don’t. Not only are Jimdo sites fully mobile compatible, but users can also edit their sites from the Jimdo app. All of the sites built on Jimdo will also be fully mobile-responsive and adaptive, so visitors can browse your website from any device. 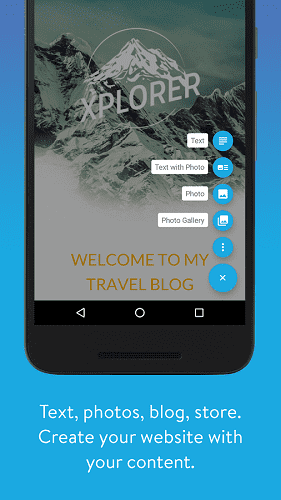 You can also go mobile yourself by downloading the Jimdo mobile app, which allows you to build, edit, and update on the go. Of course, just because Jimdo is easy enough for anyone to use, doesn’t mean the company has forgotten the more advanced users. The platform provides users with full access to the back end of their sites, making it easy to tweak the code to your liking. In addition to being one the easiest ways to build a website, Jimdo is also extremely affordable. Not only does the platform offer a solid free plan, but its remarkably reasonable paid options offer a ton of bang for your buck. To begin, the free version provides users with a personal .jimdo subdomain, 2GB of bandwidth, and 500MB of storage — more than enough for a personal website or as a way to test the waters. Free users can also create a blog, embed videos, access external widgets and apps, and even add up to five items to sell in their own online store. 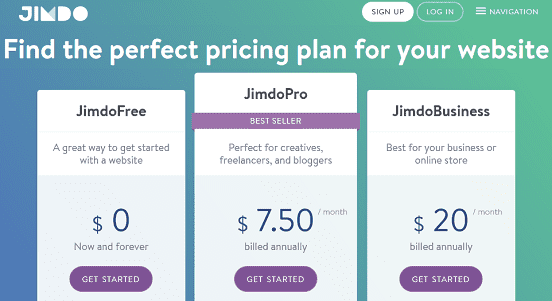 Jimdo’s free plan has everything you need to get started, but the paid options definitely provide a lot of bang for your buck. The paid packages, JimdoPro and JimdoBusiness, are feature-packed, starting with a free unique domain and email hosting. You’ll also receive more bandwidth, more storage, and larger online stores. You’ll also be able to access a host of features designed to make managing your site easier, including tools that simplify the SEO (search engine optimization) and analytics aspects of successful site growth. 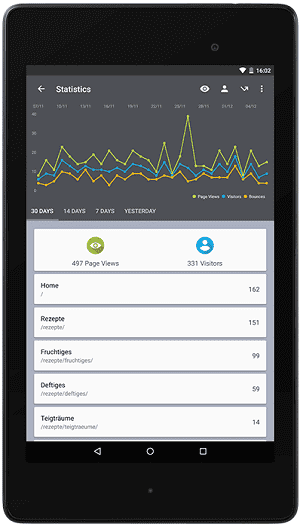 Jimdo’s easy-to-use SEO and analytics tools make it simple to promote and manage your website. Furthermore, regardless of which plan you adopt, your Jimdo experience will come with something you’re not likely to see with some of the other major web building platforms: automation. Rather than deal with outdated plugins and ever-evolving technology, you can just manage your business — and let Jimdo manage the changes. No matter how balanced your budget, sometimes you simply need to make more money. Rather than thinking of it as a chore, however, you can join the millions of Americans who have started their own businesses and become happy entrepreneurs. Of course, as stressful as starting a new project can be, it can be even more so when it involves something as seemingly intimidating as building a professional-looking website.